Making things with lively, cohesive centers (whether software, buildings, landscapes, educational experiences, or artfully designed bento boxes) involves hard work, practice, skill, reflection, and the development of a discriminating eye. 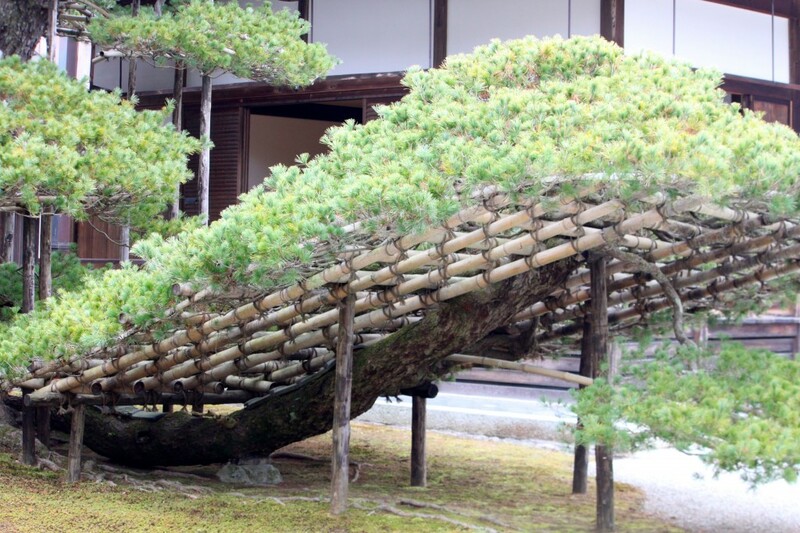 One great example of hard work over a long period of time was this bonsai boat tree I saw in Kyoto. This tree is over 600 years old! 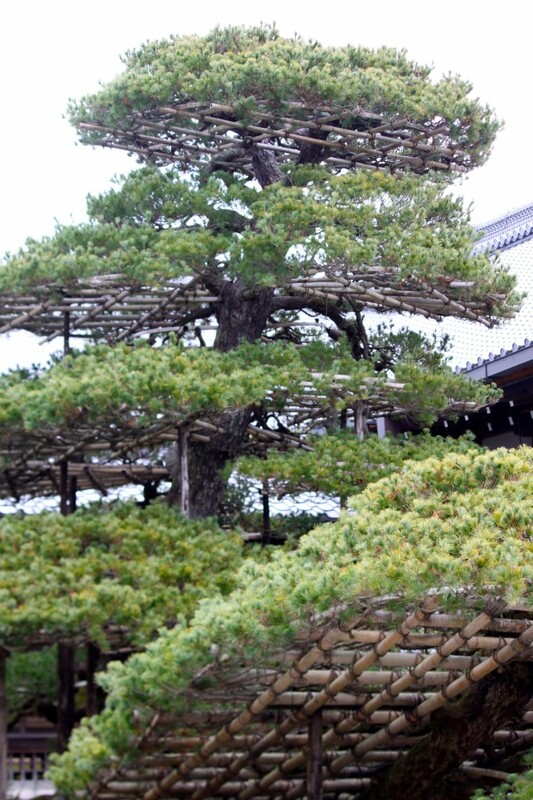 Can you imagine the effort and attention the bonsai gardeners spent over the centuries to create, grow, and maintain this beautiful shape with its many centers? I wish I could sit with great software designers and architects, soak up their wisdom, and then effortlessly incorporate that wisdom into my own code. I would love to write lively code without breaking a sweat. But that hasn’t been my experience. My first Smalltalk code wasn’t very good. I didn’t immediately get the shift from procedural thinking, where I had to worry about controlling every aspect of the call chain, to that flowing object-oriented style where learning how to delegate responsibility was key. To understand how to make my Smalltalk code lively (because of stronger centers) took practice and experimentation, reflection, and more practice. And letting go of preconceived notions that no longer fit. As I program in a yet another programming language, I can’t avoid bringing along techniques I learned earlier. Some fit. Some do not. (I keep re-framing my notions of how to implement a good design). And I keep adding useful programming techniques to my toolkit. Techniques for constructing well designed code is programming-language specific, even though underlying good design principles seem universal. It took a while for me to realize that to become a better Smalltalk programmer I had to let go of my incessant urge to understand and control every little detail (I had to do that as an 8086 assembly language programmer, my prior language). Trust in polymorphism. Delegate. Don’t try to do too much in any one method. Don’t pass in too many arguments. Let objects take responsibility for their actions. Even as I learned to let go of details, I still made dumb mistakes. Initially I didn’t understand the difference between elegant and overly clever code (I liked Smalltalk blocks—er, closures). I didn’t realize the overhead of lots of closures that held on to context. I thought it was clever that my font management code held blocks that could read fonts from the file system (embedding references to external files in them for goodness sakes). Seasoned Smalltalkers don’t make these mistakes. See this wiki page for a short discussion of Smalltalk and Closures and this Stack Overflow posting. Was I tone deaf when it came to using blocks? I don’t think so. I just wasn’t paying attention to the right details. And I wasn’t looking in the right places for inspiration or guidance. Instead of performing my own experiments, ideally, I should’ve been studying and emulating good examples. Such as the Smalltalk collection hierarchy’s use of closures. There, code blocks are used elegantly to execute differential behavior. The Smalltalk collection hierarchy is one of the most beautiful set of classes I’ve ever seen. Fortunately, I had people around me who took the time to rewrite my code and explain to me why they did what they did. Consequently, I learned to write simpler, less clever, less resource intensive, more maintainable Smalltalk code. Modules. At first, the coding technique to define a module just seemed confusing. It is. But modularity, which helps to define and separate code “centers” is really important. Not only does it strengthen a “center” by making it more defined (and encapsulated), it makes it more easily integrated with other code. Being aware of variable scope and limiting it. Not constantly searching and mucking with DOM objects on every event. Initially I was content if my JQuery searches were “optimized”. Now I am thinking how to avoid DOM references by caching appropriate state in my own variables. Not blindly nesting anonymous callbacks, but defining functions and then using them. These techniques contribute to better-defined untangled code centers. But I want to caution you: don’t blindly follow coding best practices without knowing about and buying into the rationale behind them. Arguably your code might be better if you do. But you won’t learn how to exercise judgment until you know more about why you are doing what you are doing. Understanding how to write code that has strong, lively centers takes time, feedback, and the right kind of experience.